Good BBQ is so hard to find in Mid-Michigan. Not in Chicago. J hasn’t used any vacation days since starting her new job and since we wanted to go see my niece, she decided to take a few days off which would give us a chance to catch up with both of our families and a number of friends in Illinois. On our first night in town, we hung out at one of J’s friends in Crestwood. They have a little one of their own so carry-out is one of their best friends. We were hanging out in their living room when it started to get close to dinner time. 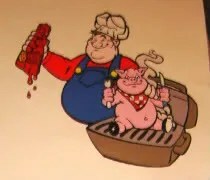 I haven’t known these people all that long yet, but they knew BBQ was a good way to earn a special place in my heart. This is a review I’ve been holding for a couple months. Honestly, I forgot about it. When I was in town for a job earlier in the year, my girlfriend’s parents took us out to dinner the night before. We drove home this weekend to see my niece and whenever we head to my parents, we stop at J’s parents on the way. 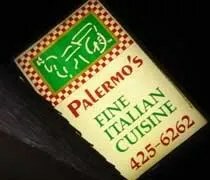 We came in to Oak Lawn late Friday night and drove past Palermo’s 95th. I remembered I never did a review so I got out and snapped a few pictures. J has always said Palermo’s ruined her on pizza. Nothing she’s had anywhere else has even come close to living up to the standard Palermo’s 95th set. I thought she was being dramatic, but I’d give her the benefit of the doubt. When her parents suggested we go to Palermo’s for dinner, I was up for the challenge.